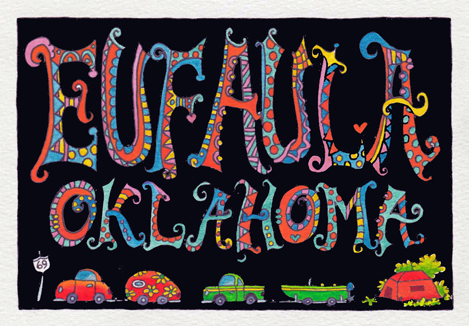 Having a little Fun with some designs for some new Eufaula postcards. I didn’t paint this one with a black background, but I used Photoshop Elements to add the black. If you look at the hi res version, you can see how much it needs to be cleaned up. So this is not ready to go to the printer at all, but it is a start. Erich Fromm, the humanist German psychoanalyst and author, is best known for his book, The Art of Loving, which describes love as care, responsibility, respect, and knowledge. Born in Germany in 1900, he emigrated to the United States in 1934, fleeing Hitler’s regime. He taught at a number of universities in the U.S. and Mexico and wrote eight books delineating his view of human nature. He believed that modern society makes us feel isolated and long to reach out to others. He died in 1980.